Most cat owners are familiar with their cats completely ignoring them anytime they try to get their attention, but the second you pick up a book or your phone, they just can’t help but interrupt things with their adorable little faces. 5. Who wants to study when you have this bundle of joy! 6. Now that’s what I’m Tolkien about. 7. Are you really going to write that? 9. It’s got good taste in literature. 10. And in the news, ME! 11. Stop using that iPad. I want attention! 12. 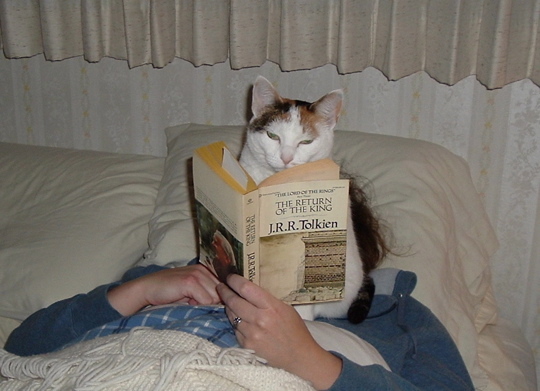 It’s cat time, not read time! 13. Whenever someone tries to read the newspaper. 14. What do you mean you have time to study!? Once You See What These 18 People Caught On Camera, You’ll Be Sleeping With the Lights On.